Justin Heavey is a senior research support specialist for the Willow Project at the State University of New York, College of Environmental Science and Forestry (SUNY-ESF) in Syracuse, New York. Since 2008, he has been managing energy and sustainability projects in higher education. In his present work, Justin helps landowners and other stakeholders who grow, use, or are simply interested in bioenergy crops. 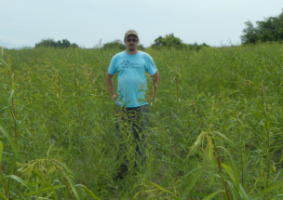 The expanding willow bioenergy industry in New York State and the Northeast benefits from his technical and analytical Extension services, such as economic analysis and crop scouting. He also does educational outreach through training and events, but face-to-face discussions with growers in the field are the most effective, he says. It’s important to listen, encourage people to ask questions, and always be available to help. Justin produces a regular stream of Extension publications that includes fact sheets, research summaries, newsletters, social media, and websites. He also contributes to applied research projects on shrub willow such as living snow fences, bioremediation, techno-economic and lifecycle analysis, harvesting, and logistics. As a senior personnel with the Extension thrust of the Northeast Woody/Warm-season Biomass Consortium (NEWBio), Justin collaborates with bioenergy professionals and other stakeholders to disseminate the latest research results and promote collaboration among the many partners in the supply chain. He serves as the NEWBio equipment program manager, helping growers to access and use specialized farm equipment to plant and harvest willow bioenergy crops. Justin can point to the 1,200 acres of bioenergy crops that today are growing well in New York State, with the potential for more on the horizon, as an example of how his work is making a difference. “Willow biomass—and bioenergy in general—is at a critical stage of development in the Northeast, so it’s exciting to be a force of change helping with green technology transfer from research and out into the real world,” he says. Following the “practice what you preach” axiom, Justin has led several environmental and sustainability initiatives on the ESF campus. He has an avid interest in campus sustainability, green infrastructure and landscaping, ecosystem restoration, and sustainable food systems. He’s published several articles on shrub willow and its expanding uses. He holds a bachelor’s degree in environmental studies/renewable energy systems and a master’s degree in forest and natural resource management from SUNY-ESF. In his spare time, you can find Justin in his garden, or cooking, hiking, or watching sports and movies.